A Competitive Event Checklist helps ensure that all written event competitors are on a level playing field. Penalty points can often turn what could be a firstplace project into one that does not even place. Here are some ways to help keep your written event free from penalty. •	Make sure the Statement of Assurances is signed by all participants and the advisor. •	Double-check to make sure page numbers in the table of contents correspond to pages in the report. •	Make sure the report follows the sequence outlined in the guidelines. •	Keep the report page count within the guidelines. •	Give it another check to ensure all pages are numbered in sequence starting with the executive summary. The executive summary should be numbered page 1. 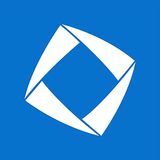 •	When you’ve completed your written entry, use the DECA Competitive Event Checklist to check yourself. 1. 2. 3. 4. 1. 2. 3. 4. 5. 6. 7. 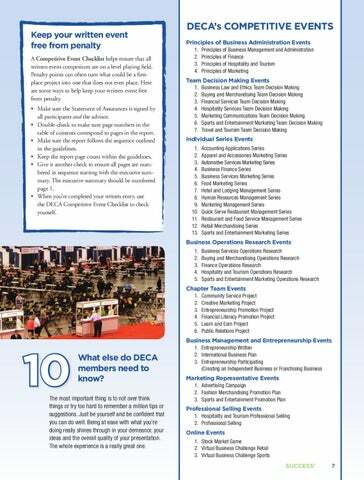 What else do DECA members need to know? The most important thing is to not over think things or try too hard to remember a million tips or suggestions. Just be yourself and be confident that you can do well. Being at ease with what you’re doing really shines through in your demeanor, your ideas and the overall quality of your presentation. The whole experience is a really great one. Online Events 1. Stock Market Game 2. Virtual Business Challenge Retail 3. Virtual Business Challenge Sports SUCCESS!